With the wedding season approaching, you would be in a great dilemma, what to wear and what to not. With the changing trend, it gets very important to cope up with it. It’s time to flaunt your gorgeousness with ethnic wear this time. You look into your wardrobe and what do you find; Anarkalis, sarees, salwar kameez, or latest punjabi suits stuff? Well don’t get pissed; it’s your friend’s wedding! 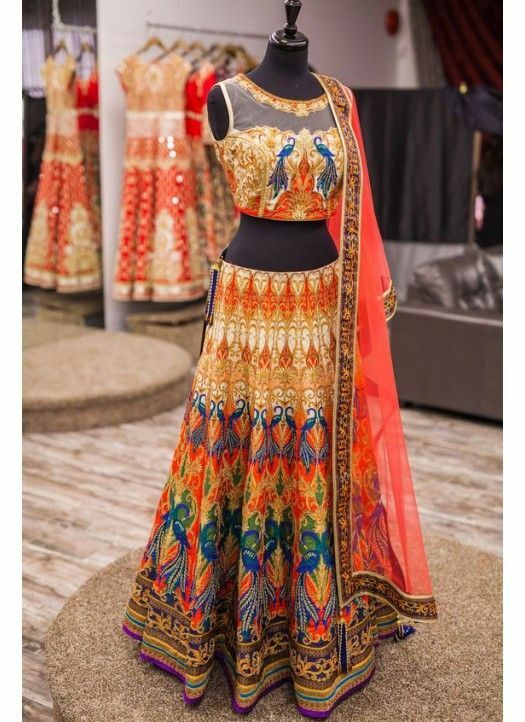 We will help you to use these ethnic outfits in a way that you would look more beautiful when you walk out there. Let’s take you through different outfits like palazzos, crop-tops, shararas, dhoti style pants, jackets, wedding gowns, kurta and Capri bottoms that you can wear on different pre-wedding ceremonies and even on the day of the wedding. In India, there are series of pre-wedding ceremonies, and generally, people ought to check out your outfits. So, yes it’s time to make them stunned. It is the top selected outfit of 2017. Indo-western outfits are a combination of crop-tops with palazzo. This outfit is a combination of western style with the latest style of crop-tops. Yes, a western outfit will give a traditional look. A chic combination of designer tops with a palazzo. The top has embellishment of embroidery and zardozi work. Pull your top up and pair it up with a palazzo. This is going to look way sexier than you think. Some of you would be still thinking after reading the title “Cape with a dhoti,” seriously? Well, it is the top running trend of this year. It is not just about going with the flow, but about bringing sense into an uneven combination that one would have never thought about. 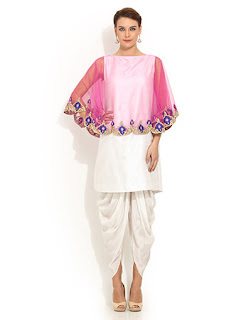 Wear a long beautiful cape with a low neck short top and pair it up with a low waist dhoti. Mojados or classic ballerina can be worn along with it. Can you see that lehenga you wore at the last wedding hidden in your closet and being avoided by you because you wore it the last time and you don’t want to repeat? Let’s bring it out and add some mixtures to make it look like you never wore it before. Get a beautiful embroidered net cape with a shade lighter than your lehenga. Floral transparent short capes are very famous for such purpose. Make a good use of what you have. As the name speaks, the top has layered bottom with beautiful asymmetrical hemlines. This is the new trendy pattern hitting the market. The top has 3/4th sleeves and can be made from any fabric you want. The best part is that this ankle length top can be designed with a different number of cuts, multiple layers, out of the line style and can get you a unique and the most appealing outfit. You can shop for the best of Anarkali dress online shopping and look ravishing. Digitally printed tops are adopted from the hand woven heavy embroidery tops that have been influencing the fashion market from a great time. The motifs work, and floral designs on dresses, sarees, and gowns have been very popular but costly. The abstract idea of printing the designs on your outfits will bring a revolution in the market and will be cost effective. There is no need for any additional jewelry that suits your outfit. These floor length printed top is the best option for your occasion. Bring out the old one and try to suit it up with palazzos, cape, dhoti or a lehenga and add new essence to it. If any new idea hits your mind, let our readers know. Write and share your story of your new experience with all. Do leave your valuable reviews below. Go girl go! Try your new outfit.